Before we use the function we need to configure the LCD pin connection using the config LCD syntax. (CONFIG LCD = LCD Type, CHIPSET = KS077). Because we are using a 16×2 LCD module, so the code should be like this. We are not defining the CHIPSET = KS077 because most text based LCD displays use th same chip from Hitachi. If your LCD modules use the KS077 chipset, you have to define it. After we define the used of 16×2 LCD Display, now we used to define the LCD pins configuration consider to the board. Please see figure 1 to get pin configuration of LCD Display, the board is not suitable for STK200 LCD pin configuration, so set the value of variables as the pin configuration of figure 1 or you can see this statement. ‘——set the LCD pin configuration. That’s all you have to do at the beginning, now lets make our LCD shows your text. LCD x , X is the variable or constant to display or if prefer to send more variables you just add the “;” separator sign among them. Please see example below. Cls function is used to clear the LCD Display from any text showed. After we clear the screen, place the cursor to the position desire using Locate function. Locate 1,2 syntax will place the cursor to the first row and column 2, otherwise, Locate 2,5 will place the cursor to the second row and column 5 where the first letter of the text start. 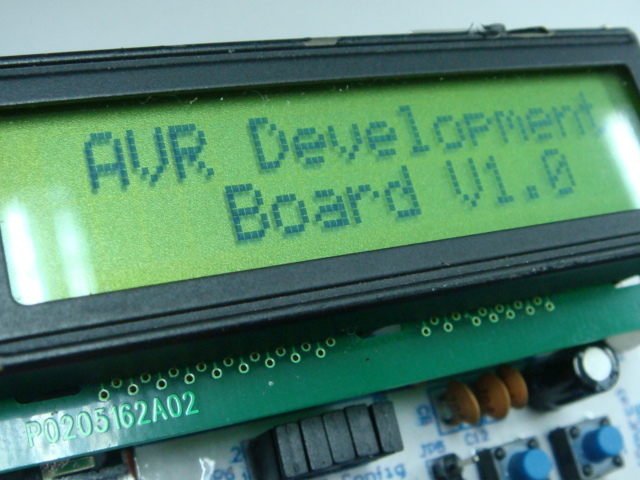 To shows the text “AVR Development” we use Lcd “AVR Development”. Wait 3 syntax will delay the process about 3 seconds. Okay, let’s try to give an animation to our text shown. First we will shift the text to left, the function of Shiftlcd Left will shift one segment/column to left. Because our LCD contains of 16 columns, so we have to shift 16 times to left to shift the all character include the space character. The second animation we’ll make the text blinking. It’s a simple way, you just make the display off and on for 200ms delay among them. And last, if you want to shows your own character to the display, BASCOM has tools to help you to generate the code for you. On the main menu choose Tools>LCD Designer, or press Ctrl+L for keyboard’s shortcut. You’ll see a small window that allow you to design your own character. If you done, BASCOM will give you a code to form the character that you made like this. Replace the ‘?’ sign with index number from 0 to 7, this special characters can be printed with the Chr( ) function. I try to insert a smiley character in the end of demo, just check this code. ← Kapal ? 30 GT, maksudnya “GT” itu apa? we can say that, this problem is one logic problem? is this is true,which part of the nelson logic circute book EXPLANATION this problem? Well I’m so sorry, I’m not using that book, so i don’t know which part of book that you mean. how i can RESOLVENT this problem? it depends on from where you place your first character (function –> locate y,x). I prefer to use 16 times shifting to ensure that the whole text are completely shifted, it was given that the size of our LCD is 2×16 characters (2 rows and 16 columns).